The aim of this chapter is to propose original applications and development in the field of robotics. Also the focus is made on the design and operation of two service robot arms. These robots have been developed in the ROBIOSS team of the PPRIME Institute (UPR 3346 CNRS) from Poitiers University, in the context of two different collaborations with industrial partners. The design procedures for these two innovative applications are detailed: industrial and entertainment. The first application concerns a wide printing application; an international patent (Gazeau, Lallemand, Ramirez Torres, & Zeghloul, 2007) was deposited for this device in 2007. The second application was installed in 2006 in the Futuroscope Park: the “artist robot” draws portraits of the visitors every day by using a camera and a pen attached to end-effector. The approach in the design for service robotics begins with the analysis of the role of service robots and with the features that are unique to them. Once the analysis is done, a technical solution is proposed, and problems are solved by using a philosophy that emphasizes compromise and practicality in design. The final objective is to propose a robot service at a reasonable cost with a high degree of integration and a human machine interface that is as simple as possible. 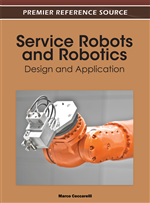 The purpose of this chapter is to propose, with two significant examples of robotics solutions, an experience feedback in the design of innovative service robots. Both patented service robots were developed in the same laboratory for two industrial partners. The intended scope is printing, but the constraints and specifications for each example are very different. The first example concerns the entire design of a printing robot with an original parallel mechanism. Thus, the presentation focuses on mechanical design and control. The second example concerns the use of an industrial manipulator for an innovative design application. Thus, the presentation focuses on the integration of an industrial robot in the design of an innovative robotic cell. Also the two service robot arms proposed in this chapter were designed by considering first the whole functions that the robots would perform. Analysing the prior art was crucial; as an example, many printers are commercially available for wide format printing while other robots use a pen for drawing. So a serious analysis of advantages and disadvantages of existing solutions is necessary. Also we are now going to detail these two applications developed by the ROBIOSS team within the PPRIME laboratory.